Eat your fruits and vegetables to strengthen your health. 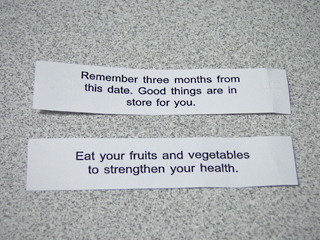 Firstly odd that there was more than one fortune, and doubly odd that they were quite specific and seemingly related. At least they seem related to me. So here I sit, hoping the Lunestra will finally do it’s magic after four days of woefully lacking performance and wondering what the future will bring. So, June 23rd… will you perhaps offer my heart’s wishes? Or are you going to surprise me altogether? Whoa, have you started up your blog again? To tell you the truth, I’ll be more than happy to have more than a single day of “good things” in store for me so I’ll look forward to both June 23rd, and the end of July when I come visit you. I’ll ask for the time off ahead of time and adjust my vacation time when your schedule fleshes out.